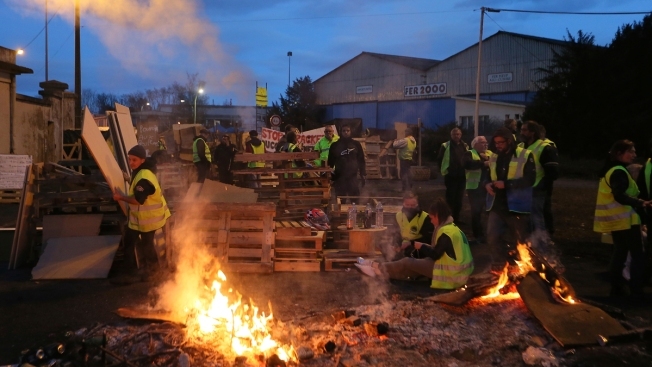 Demonstrators stand in front of a makeshift barricade set up by the so-called yellow jackets to block the entrance of a fuel depot in Le Mans, western France, Tuesday, Dec. 5, 2018. French government's decision to suspend fuel tax and utility hikes Tuesday did little to appease protesters, who called the move a "first step" and vowed to fight on after large-scale rioting in Paris last weekend. The "yellow vests" in France are worrying greens around the world. AP economics writer Christopher Rugaber and Frank Jordans contributed.